The University Jazz Bands combine the professionalism of working jazz bands with the rigor of cutting-edge repertoire. 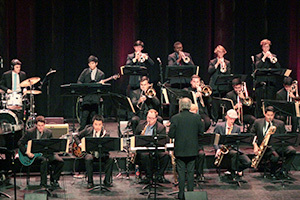 In addition to the concerts in the Performing Arts Center’s Miossi Hall and Spanos Theatre, the University Jazz Bands perform regularly at the Jubilee by the Sea jazz festival in Pismo Beach in October, the Strawberry Festival in Arroyo Grande in May, various swing dances and other concerts in the community. Pieces for the concerts can draw from almost any source — including genres such as cartoon music, Ethiopian pop music, rock, rhythm and blues, and swing — by groups such as Led Zeppelin and Tower of Power, past jazz masters and rising new musicians, as well as the most advanced modern big band compositions, often as recorded and performed by the original artists.